The festival encompasses over 40 events around the city. 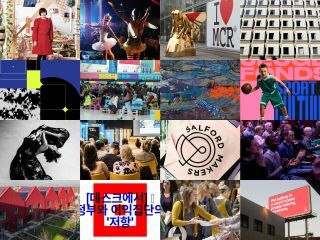 Design Manchester is a city-wide festival of creativity and design, and encompasses over 40 talks, debates, films, workshops, exhibitions, fairs and parties all over the city. Its sixth outing is based around the theme of disruption, and there’s an awesome lineup of speakers confirmed, including Morag Myerscough, Anthony Burrill and Kate Dawkins. This year’s festival runs from 10-21 October, with workshops preceding the event on 6 and 7 October. “This year the festival celebrates the noise makers, the pioneers and the inspiring creators. The unapologetically smart and funny, the humble and inspiring. The ones with the business upfront and the party at the back” say the organisers. Read on for a taste of what to expect - for the full programme and tickets for all events visit the Design Manchester website. The festival’s flagship event is the DM18 Conference, which takes place on 19 October and is hosted by Creative Review’s Patrick Burgoyne. There will be talks from artist and creator Morag Myerscough, graphic artist and print-maker Anthony Burrill, BAFTA-winning experience designer Kate Dawkins, DesignStudio co-founder Ben Wright, and Studio Dumbar creative director Liza Enebeis, Wolff Olins founder Michael Wolff, Matt Ipcar of Blue State Digital, and Kaye Dunnings, creative director of Glastonbury’s Shangri-La. As well as this awesome programme of talks, there will be separate areas hosting workshops, seminars, interactive installations, Q and As, craft and making. The Great Debate: Should all schools be art schools? Taking place in the evening of 11 October, key figures from the design industry will be exploring the tricky issue of design education. They’ll be discussing how we can improve our educational policies to meet the needs of tomorrow’s economy, and the best ways to create pathways so that all young people with talent can succeed. A huge selection of lectures, talks, workshops and tours are lined up for the festival. There’s a little something on everything, from coding (CoderDojo) to designer-making (Salford Makers party and workshops at Islington Mill) to architecture (DM18 x RIBA lecture with architect and urban designer Sir Terry Farrell), to film (a screening of Sofia Olin’s Lost in Vagueness with director intro and panel discussion), to good old design (design critic Alice Rawsthorn discussing her book Design as an Attitude). Art fans are also in for a treat. There are exhibitions and show going on all over the city. The extensive programme includes Life on the Outskirts: Helen Storey in The Vertical Gallery at Manchester School of Art, Drawing the Modern: the work of Gordon Hodkinson in the Manchester Metropolitan University Special Collections Gallery and Breaking/Faking News: Patrick Thomas in the window of Fred Aldous. Finally, there's a chance to shop for handcrafted printed gifts and homewares from local independent makers. The DM18 x The Manchester Print Fair will run from 20-21 October at the Whitworth on 20-21 October, with over 50 stalls (plus workshops from G . F Smith). There’s also the Great Northern Contemporary Craft Fair – an annual showcase of cutting-edge craft and design from over 150 designer-makers – and the Manchester Art Fair, where over 120 galleries and artists will be selling modern and contemporary paintings, sculpture, photography and editioned prints at a range of prices.